Construction laborers are skilled workers who do much of the physically demanding labor at all kinds of construction projects, from excavation to building and demolition. 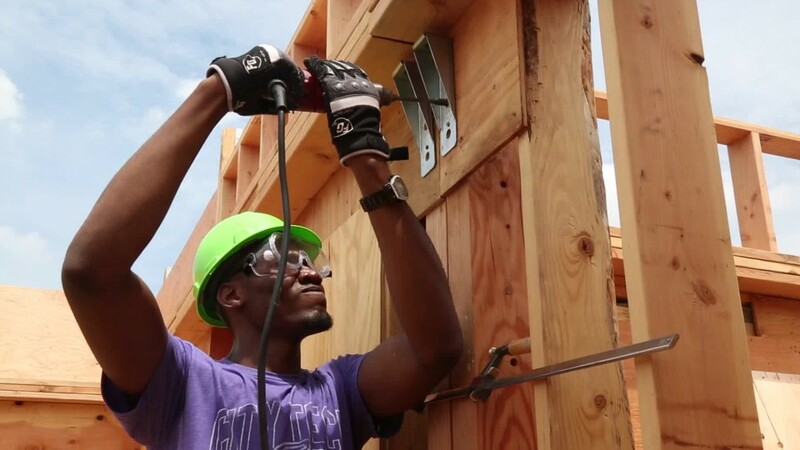 Construction laborers use a variety of hand and power tools to hammer, lift, saw, and measure materials. Depending on the specialty of their employer, laborers might prepare a worksite, dig trenches, mix and place concrete, or even work with hazardous materials or explosives. Clean-up is usually in the job description. In different phases of construction, laborers assist other trades workers, and may need to interpret plans or specifications to set work priorities. They may also direct traffic around a work area to keep other workers safe. But all construction laborers can expect to do repetitive, physically demanding work— with noise, fumes, and dangers that require safety gear such as hard hats, gloves, face masks, ear protectors, and eyewear. Some employers require a high school diploma, but related work experience, strength, reliability, and safety are often more important to getting hired in this field. Construction Laborers by U.S. Department of Labor, Employment and Training Administration is licensed under a Creative Commons Attribution 4.0 International License.